There are great sets for jewelry making. Click here for reviews and prices. Please a take look at this great blog for DIY information and discussions. Always be extra careful water near an electric drill. Make sure your drill and working area and of course hands stays dry. Do NOT touch electrical appliances with wet hands. 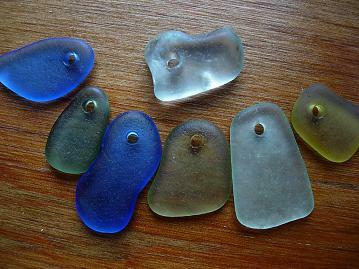 1- Keep the sea glass in the water with your fingers or a type of wise / clamp. 2- Angle the diamond drill bit at about 45 degrees (90 degrees is perpendicular, so half way in the middle). 3- Start your drill at your slowest speed, do not apply too much pressure. Do not speed up your drill or apply extra pressure. You will eventually make a hole, 1 minute sooner or later. Do not lose your patience. You may end up breaking the piece, your drill bit or ruin the tip of the bit. 4- As soon as you make your initial mark, slowly move the drill to perpendicular (vertical) position. 5- Keep it slow and with light pressure. 6- Every 10-15 seconds, move the drill bit up and let water in the hole you make. 7- To give you an idea, you can drill a regular sea glass within 60 seconds.